By the end of the 1990’s, as data from the Centers for Disease Control (CDC) mounted, society reached consensus that obesity had reached epidemic proportions among children and adults. Likewise, everyone agreed on the negative impact obesity and its related diseases have on the healthcare system, productivity and the economy at large. What could not be agreed-to was what to do about it. Differing philosophies drove passionate debate about whether marketplace initiatives, public sector interventions or a combination of both were best suited to reduce obesity and related diseases such as diabetes, stroke, hypertension and heart disease. Fresh off public policy and legal victories against the tobacco industry, one side knew law suits, taxes, bans, restrictions and shaming of food companies would quickly reverse obesity rates. The other side recognized obesity as a complex problem and believed in the power of the marketplace to prevail in the long-run. More than a decade later, there is a good case to be made that 2003 was a watershed year in the anti-obesity effort. Major food companies openly talked about developing and marketing healthier product choices for consumers. The World Health Organization (WHO) recommended member states implement junk food taxes to encourage healthier food choices that same year, kicking off an era of food policy intervention by governments large and small. Soon thereafter, anti-obesity stakeholders leapt into action from their various vantage points. However, the objectives of those with differing philosophies has been palpable from the start. Industry believes it has a duty to provide consumers with healthier product choices and information that – when fully inculcated – will result in healthier consumers and better public health outcomes. Consumer groups believe the only way to solve obesity is to force food companies to quickly and drastically change their behavior with an onslaught of government-issued rules and regulations. The anti-corporate advocates used data to prove obesity was a problem. They used data to prove the public health and financial costs associated with obesity were real. Then they lost their way. Rather than seek the truth about potential health and wellness solutions and the proper role of government, their anti-corporate bias pushed them away from the facts and toward solutions that punished food and beverage companies. In short, bias and passion to act quickly trumped evidence-based public policy planning. Supporters of that approach are now facing an important paradox. More and more credible longitudinal metrics are being added to the body of evidence that will be used to quantify the success or failure of anti-obesity strategies. For instance, have obesity rates plateaued or receded since 2003? Have diabetes rates declined? Has hypertension ebbed? Are fewer people dying of stroke and heart attack? 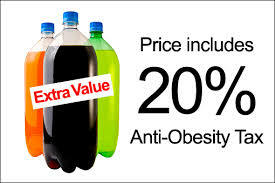 Have soda taxes cut obesity rates and reduced diabetes? Do nutrition labeling policies really impact calorie intake and nutrition quality? Do nutritious school meals help reduce the Body Mass Index of school children? Have changes to the Dietary Guidelines for Americans changed consumer behavior? Does sodium reduction “guidance” actually reduce hypertension and stroke? Data – not passion – will provide the answers we seek. Many of those who advocate government mandates in the battle against obesity were early believers in global warming based on scientific data. They also eventually begrudgingly agreed with mounting evidence that crops grown with the help of genetic modification are safe. The question now is whether the same individuals and organizations will be similarly enlightened when it comes to data indicating or proving governmental interventions are not delivering results when it comes to obesity and obesity-related public health outcomes. Yes, change takes time and some initiatives and interventions have been in place for varying amounts of time. So if you want to believe the jury is still out, that’s OK for now. But how long before data provides definitive answers? The data has already shown that changing individual and collective nutrition behavior is not as simple as getting people to buckle their seatbelt or give up smoking. It has also shown consumer demand for healthier food choices is a more powerful tool for altering food company behavior than government regulation. In the 1979 movie about the Nixon Watergate scandal, All the President’s Men, Washington Post reporter Bob Woodward’s secret source at the Federal Bureau of Investigation, Mark Felt, implored Woodward to “follow the money” to get to the truth of the story. Soon, society will have enough data to cut through the clutter when it comes to anti-obesity interventions. When that time comes, it will be very interesting to see if proponents of government interventions and public shaming of food companies will allow themselves to “follow the data.” If they do, they are likely to discover government-sponsored social engineering is not the answer to our obesity-fueled public health problem.